This special cheap and comfortable vacation home has a living-/sleeping room with an integrated fully-equipped fitted kitchen (include coffee machine, toaster and water boiler) and a tiled bath room with a shower, hair dryer and WC. 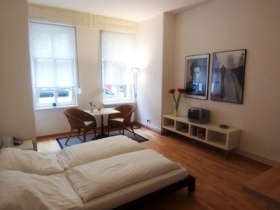 The living-/sleeping room has a double bed with a corner to sit, TV, radio and internet connection. That apartments has a pleasant atmosphere. You will feel like at home.